Coolgear’s 22W DC to USB C Power Pod adapter lets true flexibility come to light! Setup your USB C devices up to 100 meters away for power delivery with no additional electrical outlets to install. Works with Cat 5, Cat 5e, Cat 6, Cat 6a. STP or UTP cables. Allows USB C PD to devices 100 meters away. Supports PD Profiles 5V/2.39A, 9V/2.07A, 12V/1.51A, 15V/1.27A, 20.0V/1.11A. No need for additional electrical modifications in your infrastructure. Works with any USB C device that accepts power delivery through its USB Type-C port. Use the 22W DC to USB-PD Power Pod adapter with an existing POE Network. Connect the POE injector to a splitter by any type of Ethernet patch cable i.e. cat 5/6. The splitter’s barrel connector is attached to the Power Pod’s input allowing a USB PD connection through the Type-C port on the other end. 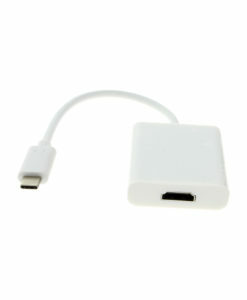 The USB-PD cable from the Power Pod can be connected to any USB Type-C device to power and charge that device. The splitter feeds up to 24V of power to the Power Pod, providing USB C PD at various profiles including; 5V/2.39A, 9V/2.07A, 12V/1.51A, 15V/1.27A, 20.0V/1.11A. The application flexibility is incredible as the Power Pod allows an installation where only one power source is needed at the POE injector point. There is NO NEED to have additional power outlets installed in the home, office, or warehouse setting. iPhone 8, Pixel and Pixel 2, Google Wifi, Nestcam, iPad Pro 12.9”, Samsung S8, Eero Pro, and many others to confirm full compatibility. The POE injector’s RJ45 Ethernet port connects to the splitter, the Ethernet patch cable allows you to make your Power Pod connection up to 100 meters away without any problems. Your USB C PD application can literally be run anywhere you want with only one power outlet. Introduces cost effectiveness by eliminating the need for additional electronics to power the device, or devices connected to it. Additional power outlets do not have to be installed. Great for security camera applications such as Nest Camera installation or POS Terminal. It can operate any USB C device that accepts power delivery through its USB Type-C port. Allows phenomenal operating distances (100 meters or more) from the POE injector’s RJ45 connection.